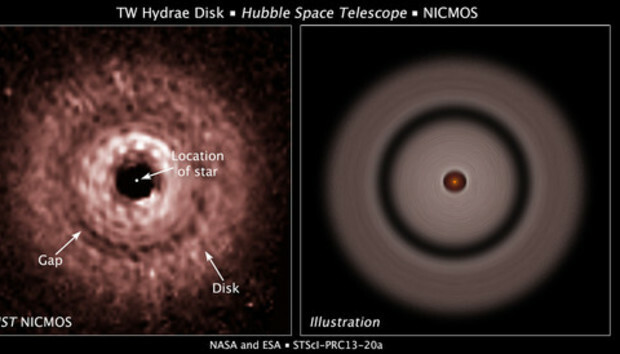 A cloud of dust grains fills the system around the star TW Hydrae, and in that cloud is an empty swath of space that experts think is caused from a forming planet. The thing is, there shouldn't be a planet there. Planets generally form from tiny bits of space debris floating around a star that collide and stick together. Then the not-as-tiny bits stick to other not-as-tiny bits and form kinda-bigger bits. This process continues until the bits become planets or gas giant planet cores. That's all fine and well, but experts are puzzled because such a planet would run counter to existing theories in planetary formation. If a planet-in-the-making created that gap in the debris cloud, it's way too far from the star, and there isn't enough nearby debris for it to form in the normal way. Additionally, scientists believe this planet should have taken 200 times longer to form than it has, given TW Hydrae's young age. In other words, there shouldn't even be enough debris near the star to form a planet yet. As if that's not enough, this planet-to-be seems to be moving slowly, which means it's not gathering a lot of debris anyhow. To use scientific terminology: This one's a head-scratcher. Scientists wonder if perhaps a collapse due to gravitational instability could have created conditions under which a planet might form more quickly than usual. Of course, they can't even find the planet they think might be there, so they can't compare it to its footprint. Astronomers (who always love to get a closer look at something) plan to use the James Webb Space Telescope when it launches in 2018. In conjunction with Chile's Atacama Large Millimeter/ submillimeter Array (ALMA), we should get a better look at the hole which might well have been made by a planet that shouldn't exist.